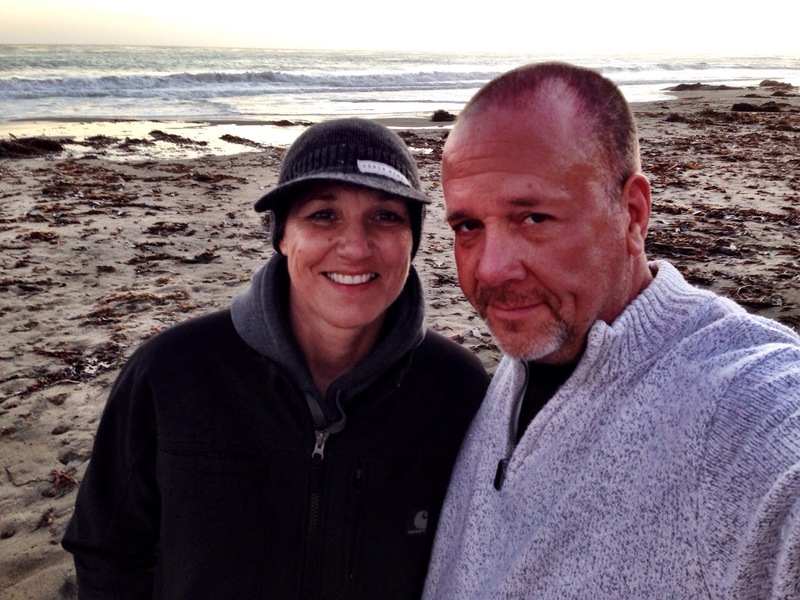 A little over ten years ago we were married on this beach. A year before that we brought our kids here to kayak the cove and try a little blending. We’ve been coming back ever since, the one destination that we return to about every year, and at seven hundred miles away, not to mention the drive through Lost Hills, that’s quite a commitment. It’s more than a sentimental appeal, though. 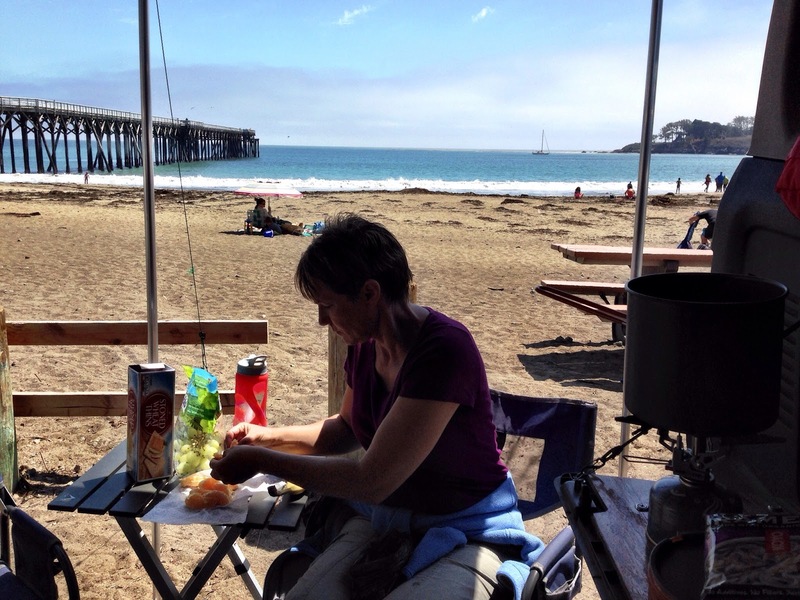 While we were enjoying the best burgers ever at Sebastian’s at the Cove, a neighbor at our outdoor counter, upon learning about our San Simeon habit, said, “I bet you don’t see anything change around here in ten years.” He was right. There’s something about consistency of place, an unchanging context, even with the weather and the ever-present scent of eucalyptus that whispers to me that I’m home again. The trip out is on concrete and asphalt slabs crossing the great Mojave Desert from Hurricane on I-15 through Vegas, Baker to Barstow. Pick up 58 to Mojave and Tehachapi, where we camped for the night, and then on to Bakersfield where we took the 99 north to Famosa, take 46 west through the valley to Paso Robles, the 101 south to 46 again to the PCH. North on 1 and ten hours later you’re there. If you’ve done this you know it’s mind numbing. While very little changes on the Mojave, the changes that do happen are pretty big. 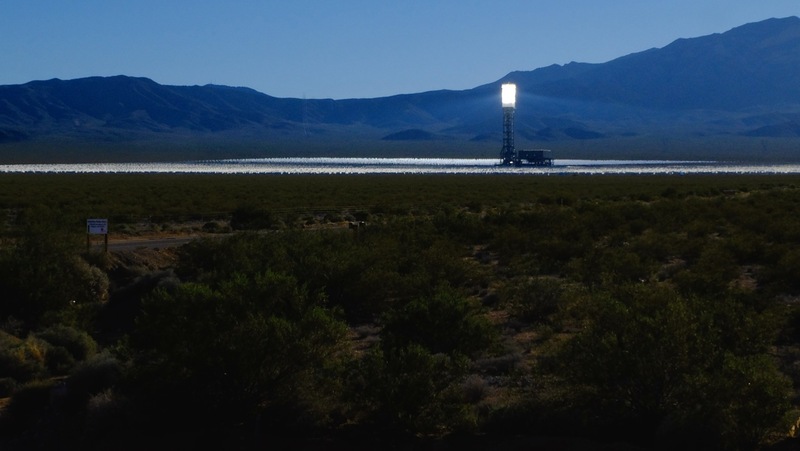 Like the Ivanpah Solar Power Facility. We passed by this two years previous while it was still in the process of coming online and grabbed a shot through the sunroof. 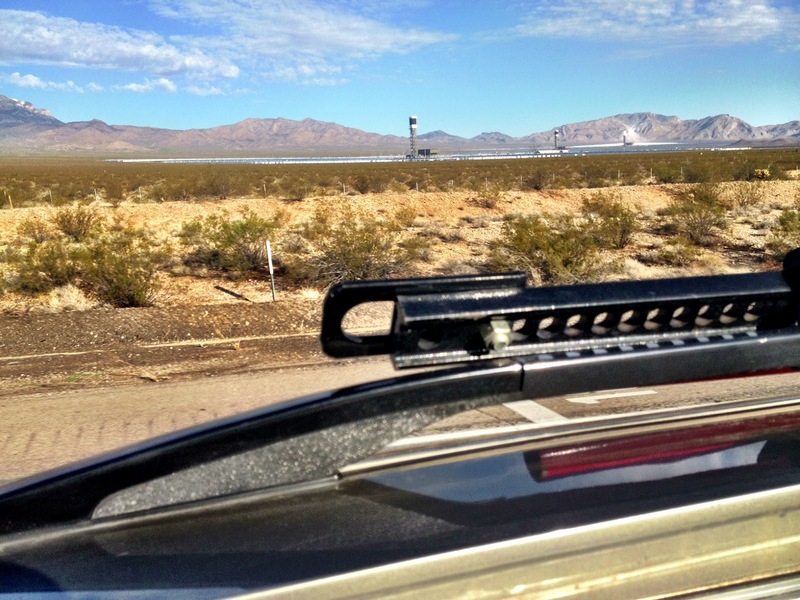 The solar flux generated by the 173,500 heliostats creates ambient air temperatures up to 1000 degrees, vaporizing anything that should fly through its aura. The plant generates almost 400 megawatts, and sends most of that power to San Francisco. This is amazing to me – while small in scope compared to, say, the Hoover Dam, it’s gigantic in terms of ingenuity and execution. The Mojave has small changes, too. 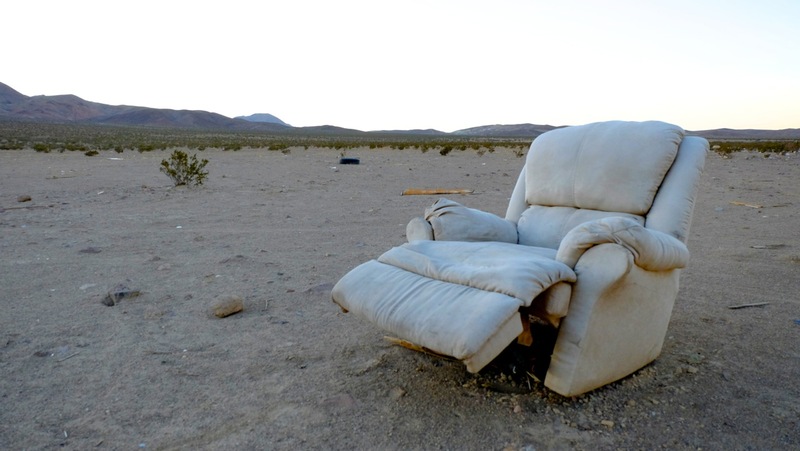 We stopped near Yermo to break the dogs and our sciatic nerves passing a sign along a frontage road that indicated, “Early Man Site.” This is what we found. So, he seems to have been both much more advanced than we thought, yet, just as much of a slob as he is today. Having left Hurricane late in the afternoon on Saturday, we reached Tehachapi around ten that evening and camped at Mountain Valley RV park, just adjacent to Tehachapi’s glider port. Nominal fee, nice facilities, a great stopover to break up the monotony of 700 miles of slab. 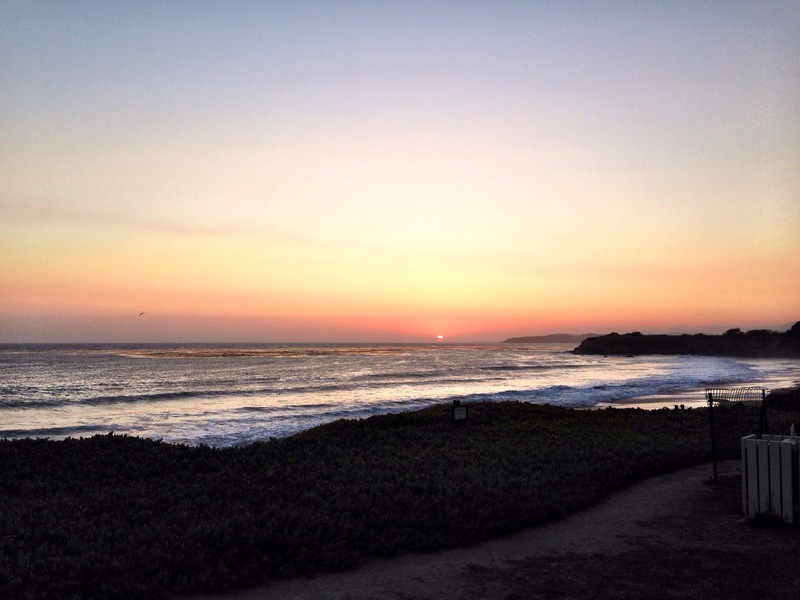 We arrived at San Simeon a day earlier than our campground reservations, so we toughed it out at the Cavalier Resort for the evening (about which I’ve written before), basking in stark contrast to what we’d be living in the next four days. We planned to end our trip there as well, making anything in between tolerable. The resort is built on the edge of a small bluff that breaks out to the beach, just a few steps from the sliding glass doors of our room. We spent the evening by the traditional fires on the bluff, took in a lithium sunset and had a nice visit with a family from Pasadena. I took the girls out early the next morning for their walk. They got a second walk in after breakfast. While it may be cruel to deny them a romp in the waves (their day would come), we remembered their lack of discretion when it came to drinking sea water, which makes for both a surprising and saturating liquid experience in places we’d rather avoid, like our room or the H3. 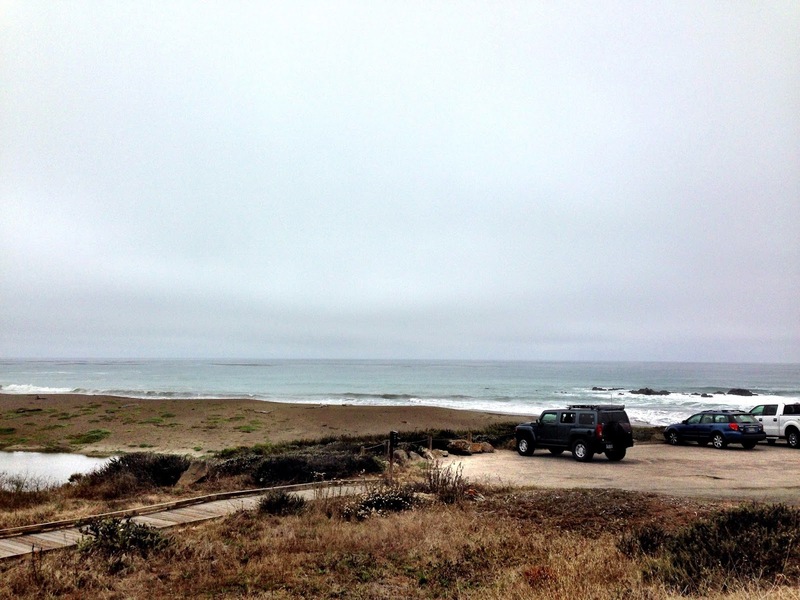 We picked up a few groceries in town and staked-out a preschool where Mindy had scheduled an interview for her graduate work research, and then checked in at San Simeon State Park Campground where we’d be through Thursday and put up camp. The grad student hard at work. Our only chagrin with SSCG is that their beach access doesn’t allow dogs, not that this had stopped anyone else but us. 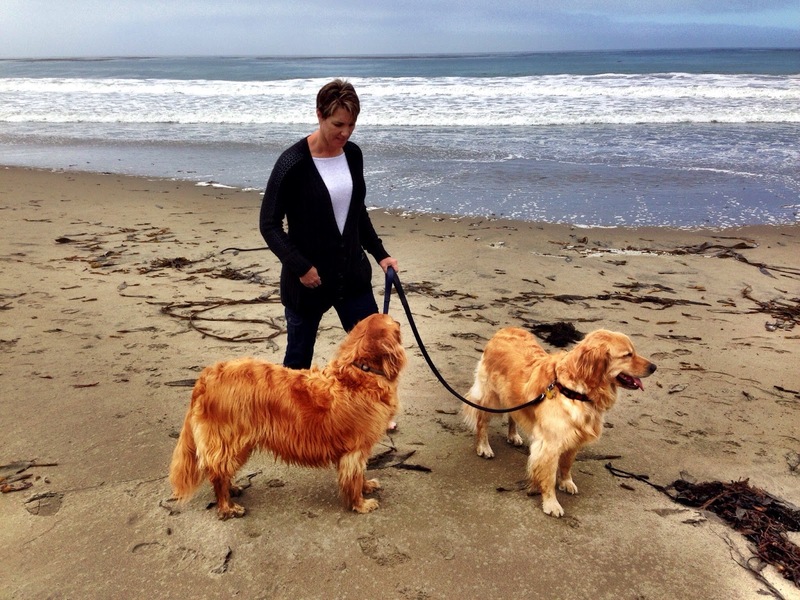 We left the girls in the tent for a quick stroll to the beach for another sunset. Yes, it’s cool there, cold to Mindy, highs in the low 70s, overnight lows in the low 60s. My kind of weather. Mindy’s interview was the following morning after which we had lunch at the Moonstone Bar and Grill and camped out at Moonstone’s boardwalk where the pooches and I enjoyed the dozens of squirrels along its path and Mindy worked on synthesizing her deposition and posting it to her class online – the wonder and joy of a personal hotspot provided by an iPhone. 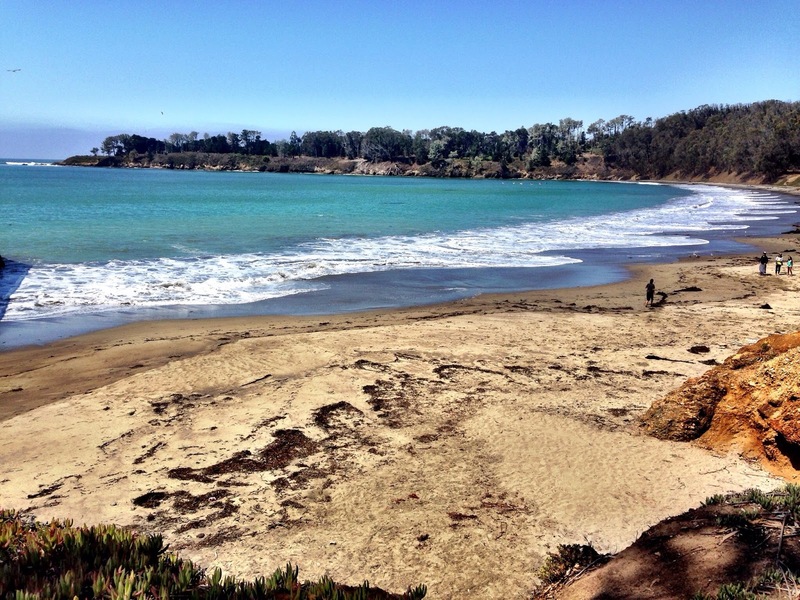 Later that afternoon we landed at our hallowed ground, the Cove at San Simeon. 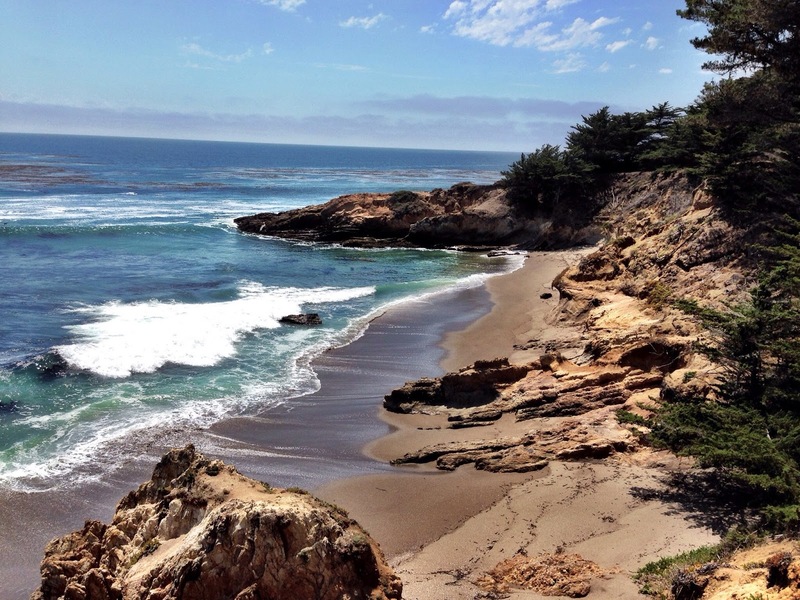 This is a wonderful of example of public/private ownership – the Hearst family owns and maintains the beach and point to the north of the cove while the state owns what lies south of the Arroyo del Puerto. 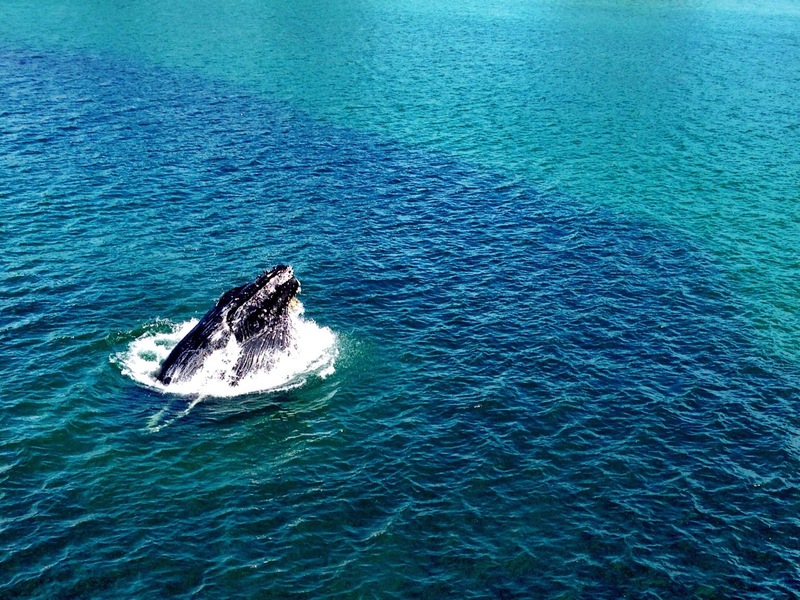 In all the years we’ve been coming here, and despite much optic nerve strain, we had never seen a whale. 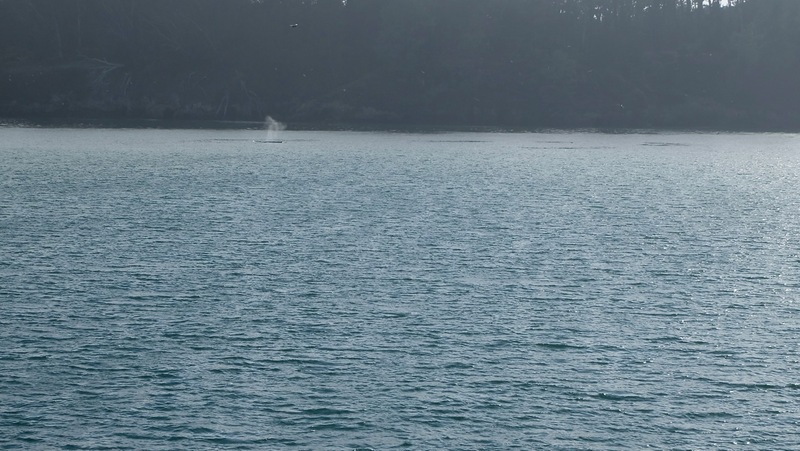 That changed for us Tuesday afternoon, where at least four small humpbacks had entered the cove to dine on krill. They kept their distance from the shore and the pier, teasing us with an occasional spout, just out of reach of a crappy short zoom. We later ditched all things photo-taking and found ourselves on the pier where one humpback decided to give us all a show, swimming up along side and emerging just below us. Yep. No camera. But that mattered little, since while very little changes in the Cove for us, this was significant, a bucket list item for Mindy, along with her realization that all the while we’ve been kayaking the cove, things of this magnitude were going on below us. I don’t think she’ll ever go out there again on a kayak. 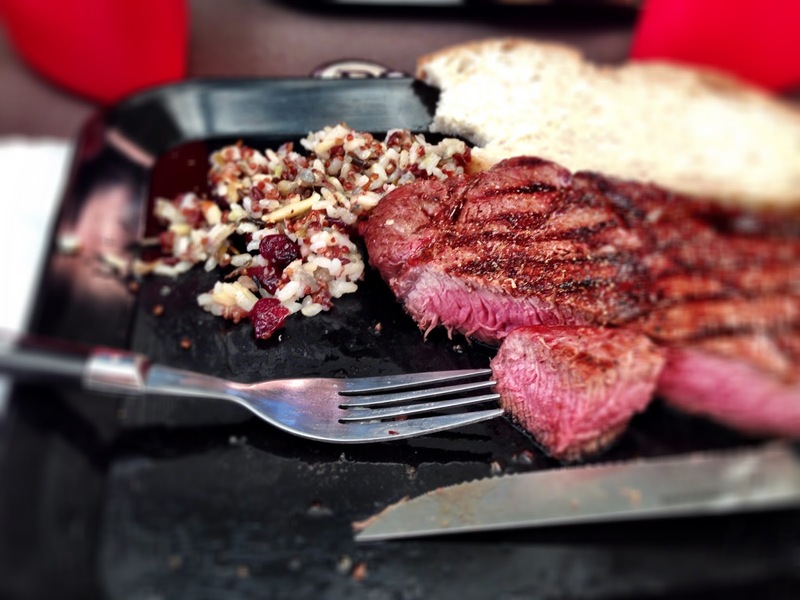 We made it back to camp and made a meal of Hearst Cattle sirloins and a quinoa and brown rice salad with SLO sourdough. I’ve finally got our camp kit dialed in to be both compact and accessible, and yet provide enough BTUs and flexibility to cook things more sophisticated than dehydrated fare. 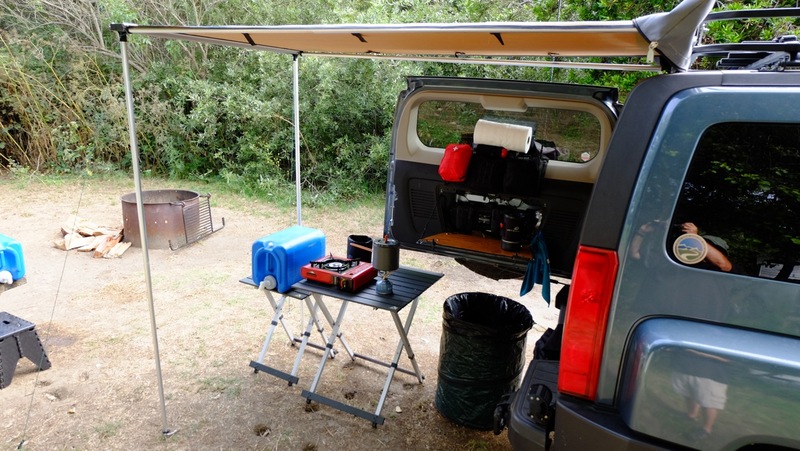 With the rear awning deployed, the back of the H3 becomes the pantry and fridge. 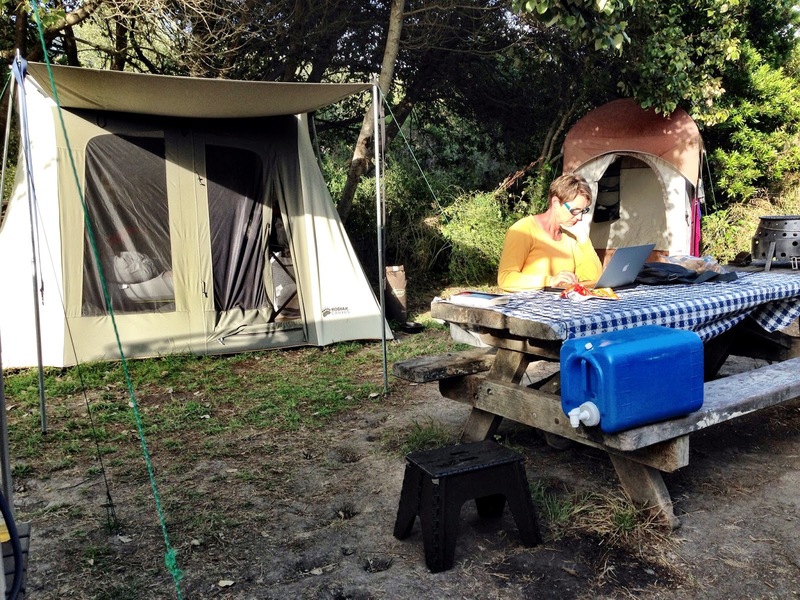 The rear door becomes a workspace and the GCI tables our stove and sink. 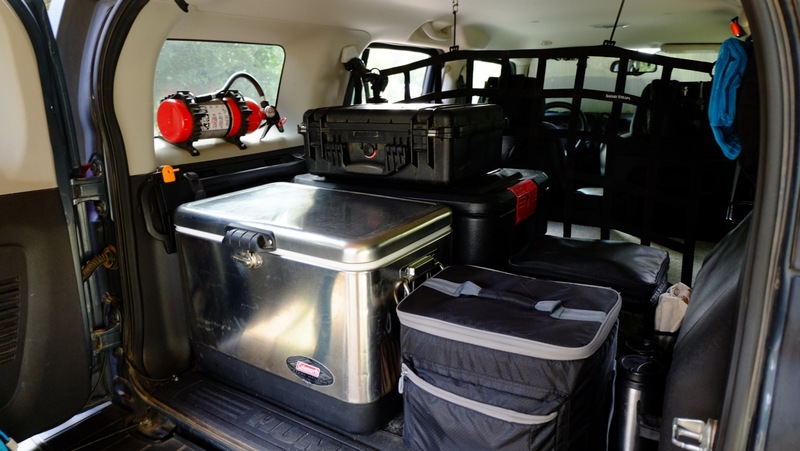 Not pictured is the Volcano collapsable grill and the Helios pressurized water system. 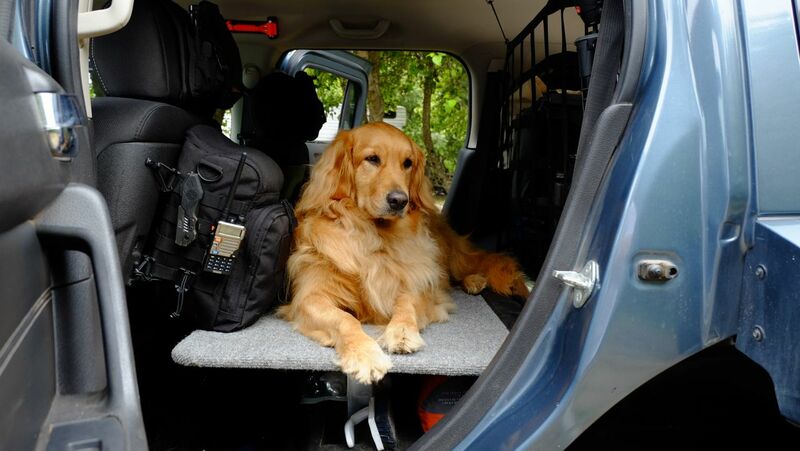 Since we often cook on the road, this made it easy to pack up and go. 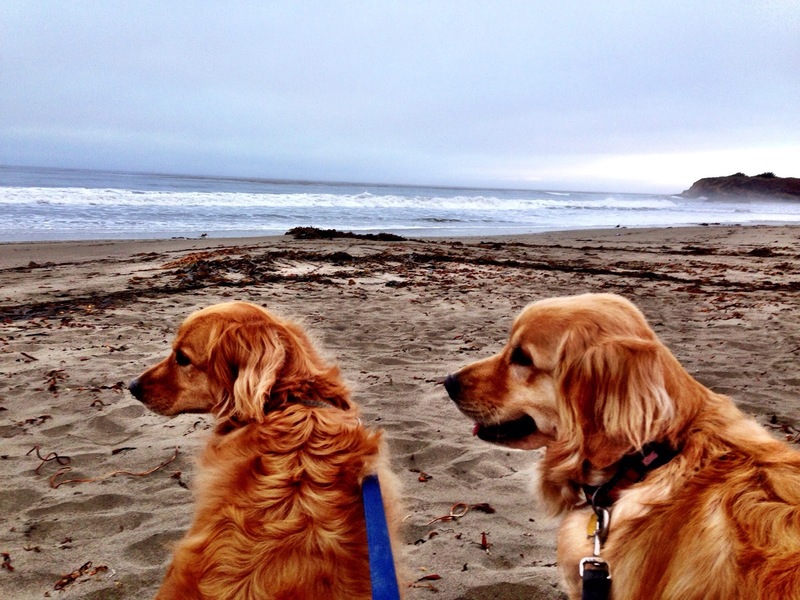 Wednesday was dog day, their turn at the beach. 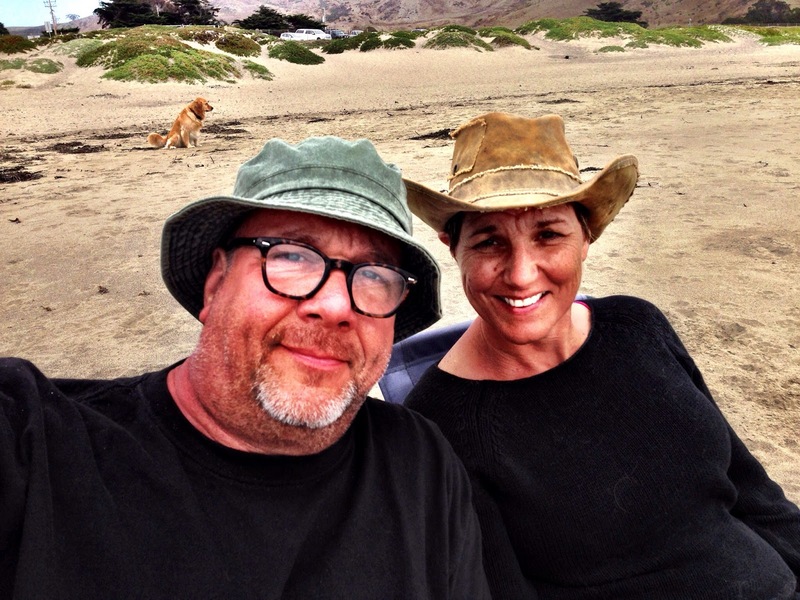 Before hitting the dog-friendly sand just north of Moro Bay, we went shopping in Cambria where Mindy found the hat she’d been searching for. 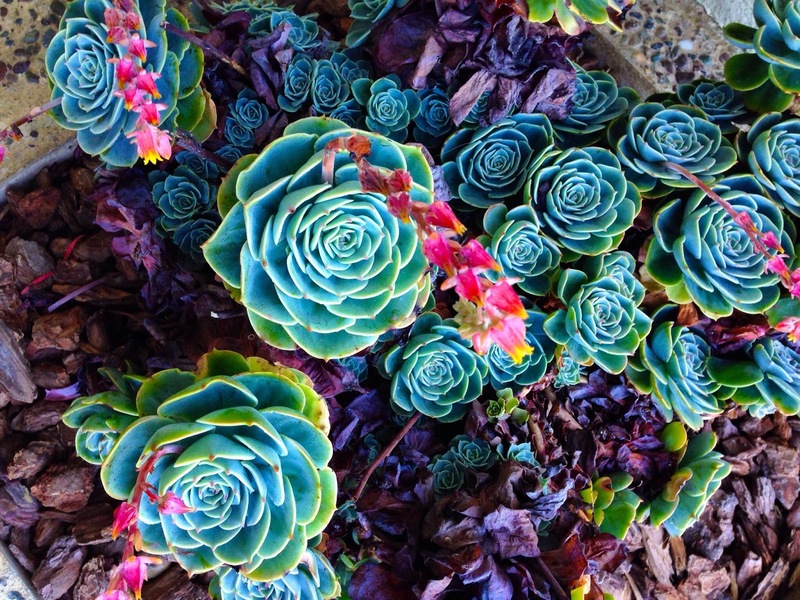 The shops in Cambria are landscaped in indigenous flora like these. We settled in for the rest of the day at the dog beach, had a great picnic and watched the girls lose their minds in the surf. We thought to take at least one selfie, in which Maryann, who’d otherwise be right at my side, decided to photobomb. 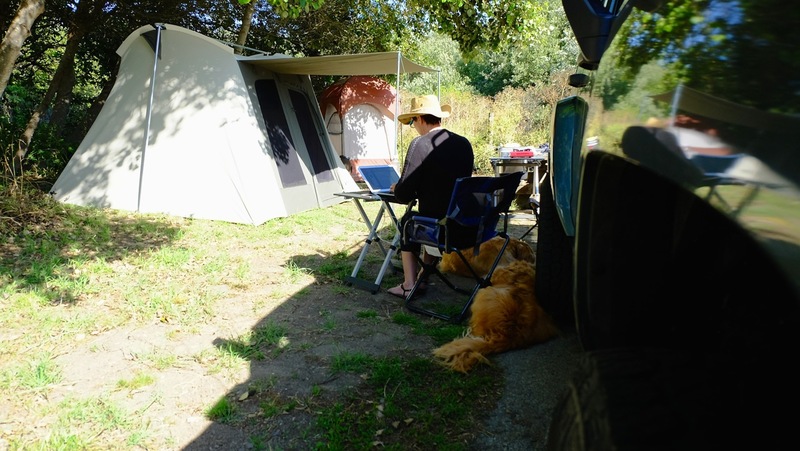 Back to camp by early evening where I settled into Richard Ford’s latest novel and Mindy cracked open her MacBook once again. Were my students half the student she is my job would be too easy. We enjoyed the most comfortable nights of our camping career with this most recent inventory of gear: a new Kodiak canvas spring bar tent, a Coleman queen airbed cot, and a pair of ALPS sleeping bags with a pair of Teton Comfortlite self-inflating pillows. 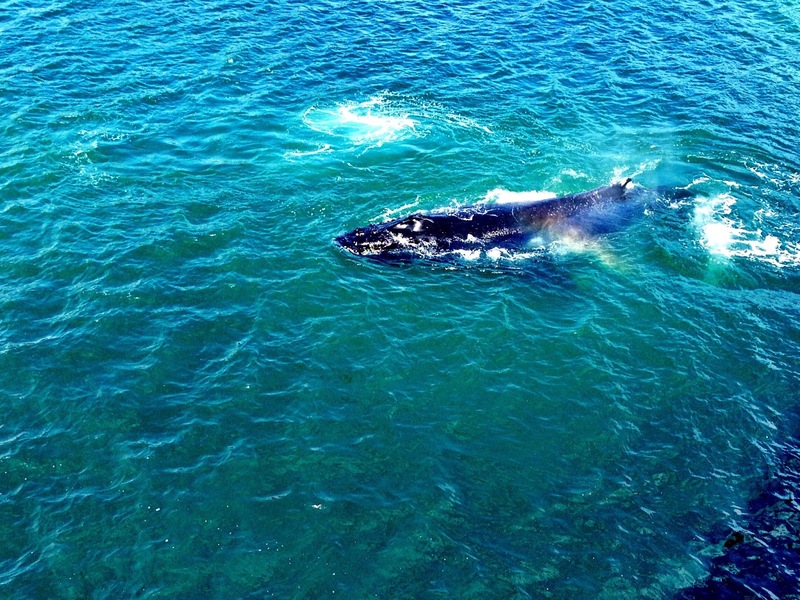 Thursday was spent at the Cove where, iPhone in hand, I was able to capture the humpback visitors. No prose, at least from me, comes close to describing the awe. Friday morning we struck camp and headed back to the Cove to spend another day. Ginger took her spot instinctively, as if she new what comfort was ahead at the Cavalier. She’s more the indoor dog. In all our visits to the Cove we had yet to hike the trail the winds its way up the bluff and out to the Point. I’ve kayaked out and around, but we’ve never gone by foot. Within a few yards we were enveloped in eucalyptus trees. 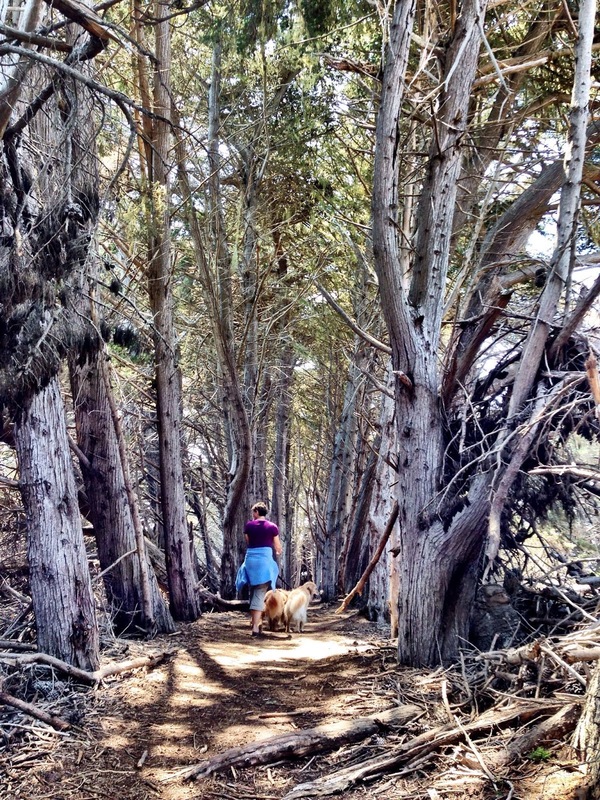 They made up an enchanted forest, lining the trail to an isolated beach and acres of tide pools. This topped it off for us, first the humpbacks, and then this walk. The image at the top of this post is the view back south over the Cove from the trail. 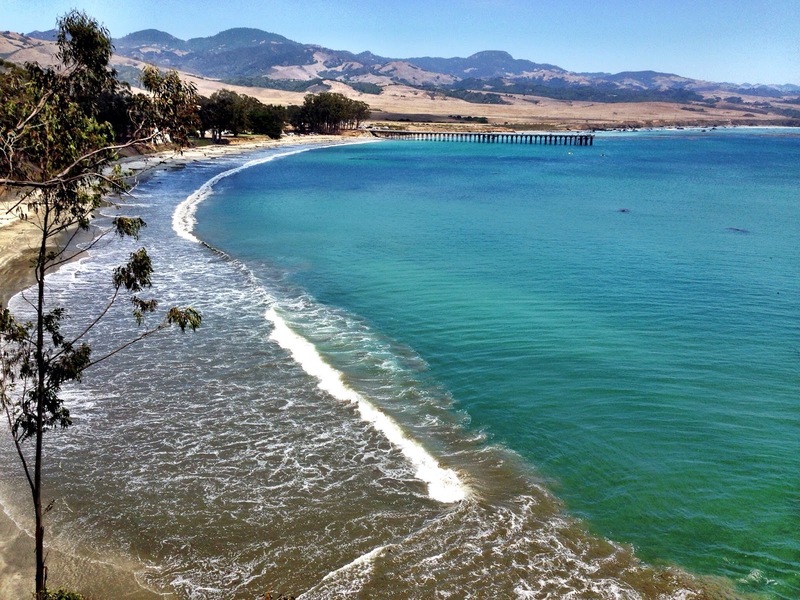 Look closely and you can see a whale in the Cove, the sanctuary of San Simeon. On our return to the beach, we made a hot lunch out of the back of the H3 and kicked back until check-in time at the Cavalier. Just as the excitement at the top of the trip, melancholy seeps in at the end as we relaxed and bathed and napped in the comfort of our room. Even the girls crashed enjoying cut-pile carpeting over the sealed canvas of the Kodiak. They must be. Fortunately, some things never change.